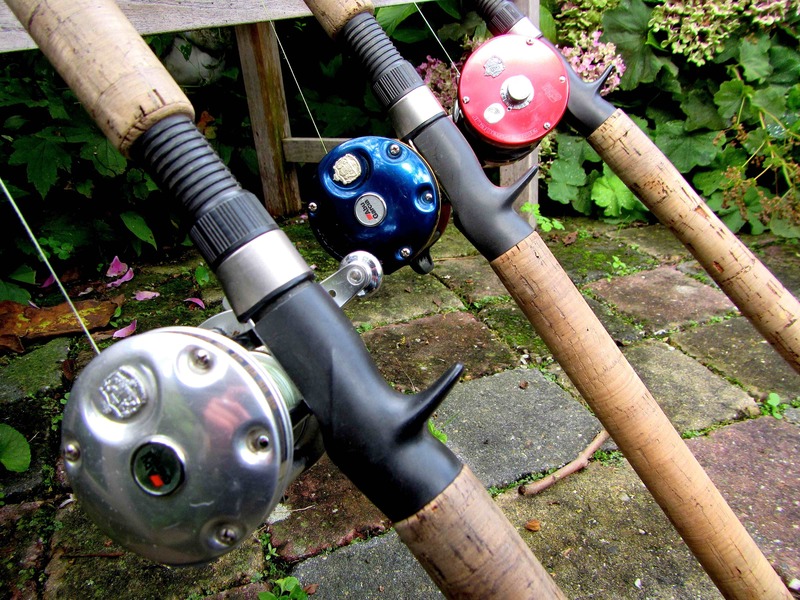 Rods, in the article ”The basics of Pike fishing” I already told you wich ones I use. In this article we deeper into the subject of it. If you would go to your local tackle store, you might find yourself in a jungle. There are rods all over the place! Each one is there for different kinds of fishing. It’s actually a good thing that there is so much choice on the market as we know it today. There is a rod out there that suits anyone’s budget and needs. And if not, it can even be build! Back in the days rods were made of glass, but nowadays it’s all carbon and other high-end materials that money can buy. Stiff rods, medium heavy action rods, fast rods, etc. It’s all out there! But what do you exactly need for your kind of fishing? By no means is necessary to fish with a heavy combination in a small body of water like a canal. The biggest fish there is probably not as big as the ones you find on a lake or in a river. Remember the stiffer the rod you use, the less the fight will be when hooking a fish. I remember being out with a friend on the river when a 45 inch fish hooked into a topraider. I just landed a slightly smaller one on it, that didn’t put on much of a fight. This bigger fish however, came right out of the vegetation when I was fishing it close to the edge. All of a sudden everything exploded close to the boat, but after that, not much happened. ”You got another small fish” the guy next to me asked? Well I said, it’s a small fish, not as big as my personal best… His face told other things when we netted the fish for the small journey to the boat and back. The rod that I was using didn’t showed much of a bend. In fact I was fishing with my St.Croix PM70HF2 [2-6oz] that day. It was the day before a high pressure front came in, and the weather forecast showed high temperatures for the next few weeks, and I wanted to make sure, that when hooking a fish, it could go back as quick as possible. This particular rod did a great job that day. The fish was released in less than 5 minutes of being caught. Below is a picture of the fish. The one that hit a topraider in natural perch pattern. There is also a downside of using rods that are very stiff and heavy. When a fish goes into ”Performing headshakes” mode, you have a bigger risk of loosing it. Especially when fishing for Pike. The rods that I use were originally designed for Muskie. 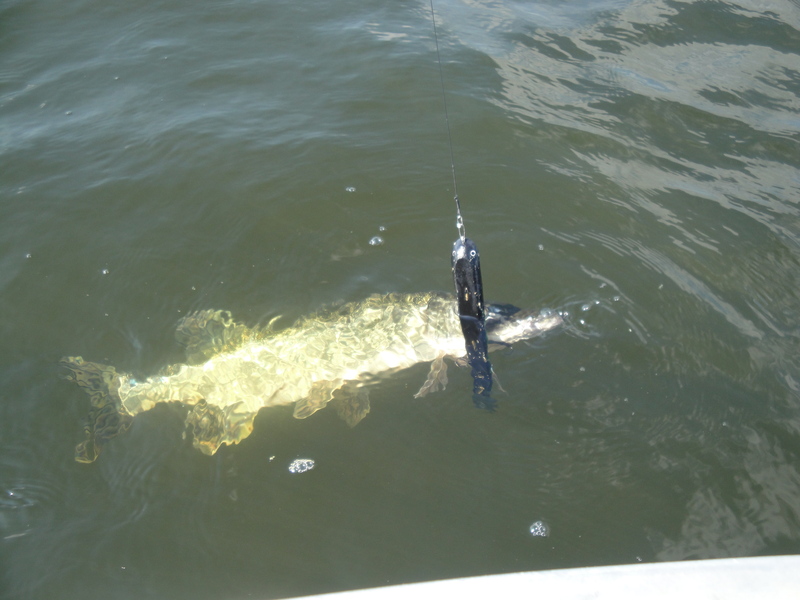 And because Muskies have a harder lower jaw, you need a stiff action rod to set the hook properly. Pike have not and that immediately explains the loss of fish. Unfortunately I have lost several big fish this way, but that’s the risk of it. As already mentioned, in some occasions you can’t go out without one, and I take the lost fish for granted. Same goes for the other St.Croix rod that I own. Altough it’s half the weight of the 6oz rod, it’s still kinda stiff. But I like that, because I use it all the time to jerk in fast gliders like the beer belly or buster jerk, and fish with pullbaits that need a good pull like the Suick or Bobbie bait. In this scenario the stiff rod is a great addition to your collection! It can handle just about anything. Over the years I found out that when fishing with much softer rods, you couldn’t get quite the action you wanted to get out of a pullbait. Especially when trying to fish it as deep as possible the stiffness comes in hand! During spring time I use my St.Croix PM70MHF2 [3/4 – 3oz] for fast or medium jerking with glider. In some situations you need speed, and even in winter, when the water is very cold, this can make a huge difference! Thats why I’d like to use a some what lighter stiffer rod like the 3oz version above, when the hook needs to be set on the Pike to be my guest in the boat! A Pike that couldn’t resist a Suick. Nearly all the rods I use for Pike fishing are designed for Muskie. They are made of high quality components, and last long. As mentioned before I’m a big fan of quality, so this matches my fishing perfectly. I try to stick to a minimum of tackle when going onto the water. Bringing a whole arsenal of rods with you on a days fishing isn’t needed. The rods that I have cover all the techniques I use. A technique we often practice is trolling heavy crankbaits. I bet many of you know how effective this can be during fall and winter. For this type of fishing I like to use a longer rod, with a more parabolic action. I have found the perfect rod for this occasion in the Musky Innovations Pro Series of Bulldawg rods. Mine is a regular 9ft with a casting weight of 1 1/2 to 7oz, and has a medium heavy action. For me this is probably one of the best rods I’ve ever fished with. I just love it! The action is great, and it’s very sensitive and certainly helped me to catch more fish! I also own a spinning version of the rod, wich is used for vertical jigging Bondy Baits along the contours of the bottom. You want to have a rod that is heavy enough to set the hook. Not a whippy rod that absorbs all the energy when hooking a fish. When jiggin lighter baits such as 4 to 6” softbaits I use a Carrot Stix. Like the name already tells you, it’s made out of the fibers from a carrot. I first encountered this rods at the Tackle Trade World Fair back in 2008, and I was blown away by their action and sensitivity! Back than I used to fish on zander on quite a regular basis, and this newly produced rod what the best I’v ever felt. It is so sensitive, that when I was jigging around the river bed, I could feel the difference in bottom structure, sandy or muddy, and if there were stones or not. It’s truly one of the best inventions in the fishing world as we know it today. 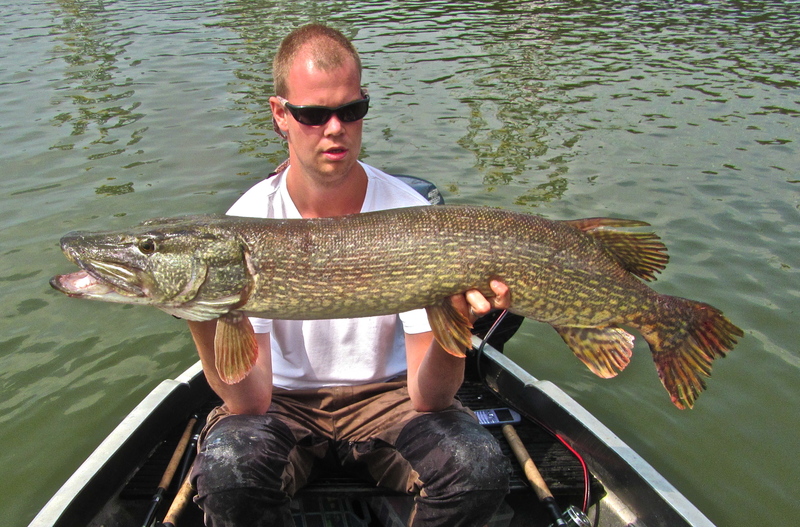 7 ft in length is the magic number when it comes to choosing vertical jiggin rods for Pike. Not too long, not too short. When it comes down to using a heavy fireball combination, I stick to my Cormoran Black Bull rod in 3oz. It actually took me a while to find one, because it was a discontinued rod. But in the end it was all worth it! This rod is also 7ft and alltough the tip is sensitive it’s a stiff rod on wich you can perfectly sett the hook. The handle of a Carrot Stix. You won’t find greather sensitivity anywhere! In the end, choosing the perfect rod all depends on your own way of fishing. What you use it for can be totally different than anyone else. If you are intersted in any of the rods described in this article, I’d suggest you take a trip down to your local tackle store, and check them out. I’m sure you will find something that suits for fishing needs out there!